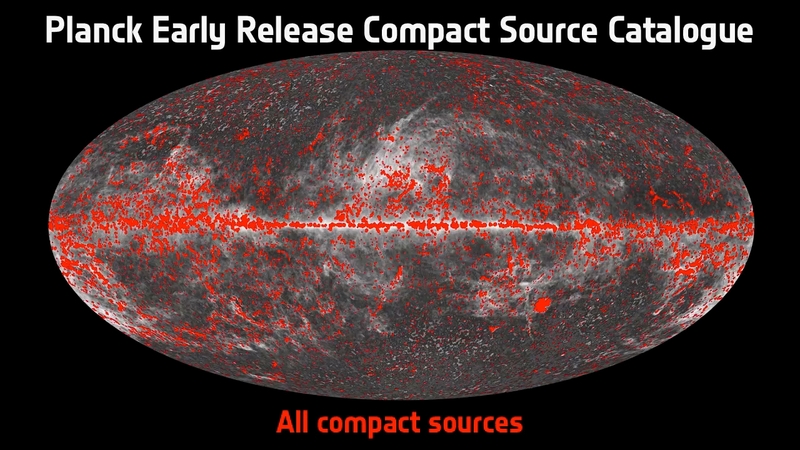 This image illustrates the position on the sky of all compact sources detected by Planck during its first all-sky survey and listed in the Early Release Compact Source Catalogue (ERCSC). 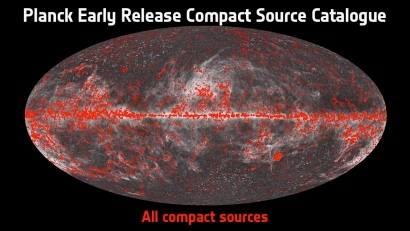 The ERCSC contains more than 15,000 unique compact sources. These sources have been extracted from the individual lists of sources detected at each of the frequencies probed by Planck by applying a specific set of criteria which identify single sources from sources in the individual lists which are at the same location and at adjacent frequencies. The ERCSC comprises a wide variety of astronomical objects, both galactic (features in the galactic interstellar medium, cold molecular cloud cores, stars with dust shells) and extragalactic (radio galaxies, blazars, infrared-luminous galaxies, and galaxy clusters), and it represents a rich and robust database for the entire astronomical community.